The most unexpected trend in the mortgage rate world of late has been the squeezing of variable-rate discounts. The Spy warned of diminishing variable-rate discounts last month. Since that time, they’ve shrunk 20 basis points on the most competitive uninsured variables, costing new borrowers over $2,300 more interest over five years on a typical $250,000 mortgage. 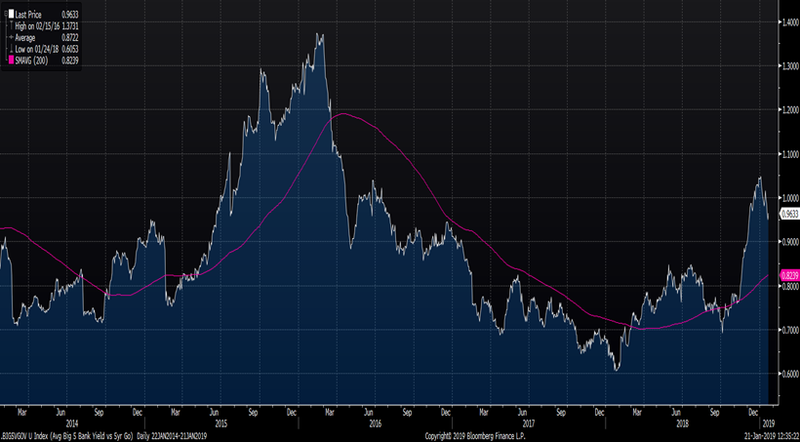 On the insured side, the discount is down 8 bps. That smaller impact is because there’s more competition for insured loans. The jump in variable pricing caught most by surprise and the reason is simple. 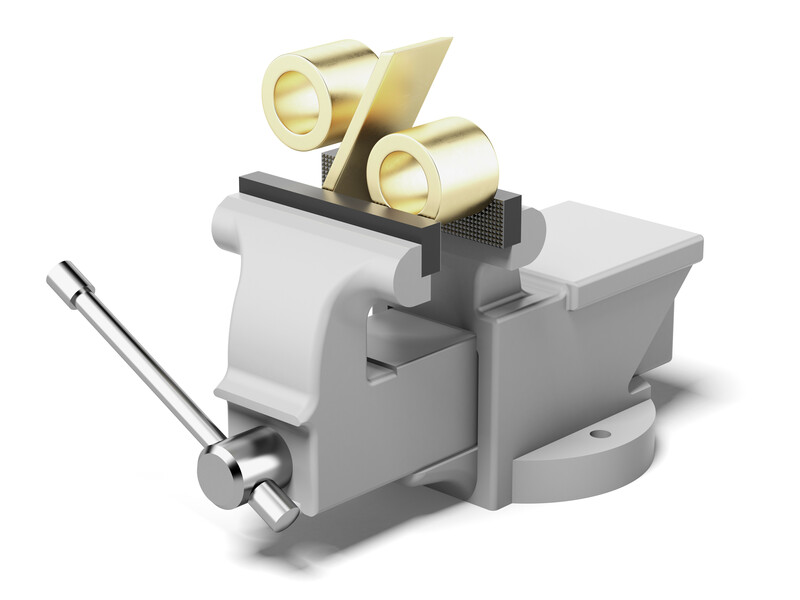 Unlike fixed rates that primarily follow bond yields, variable rates are different. Apart from the obvious—Bank of Canada overnight rate changes—variable pricing is impacted by other, more obscure factors, like moves in bankers’ acceptance yields and shifts in credit spreads. Those other factors are harder to track (unless you’re a market professional with a Bloomberg terminal or equivalent). 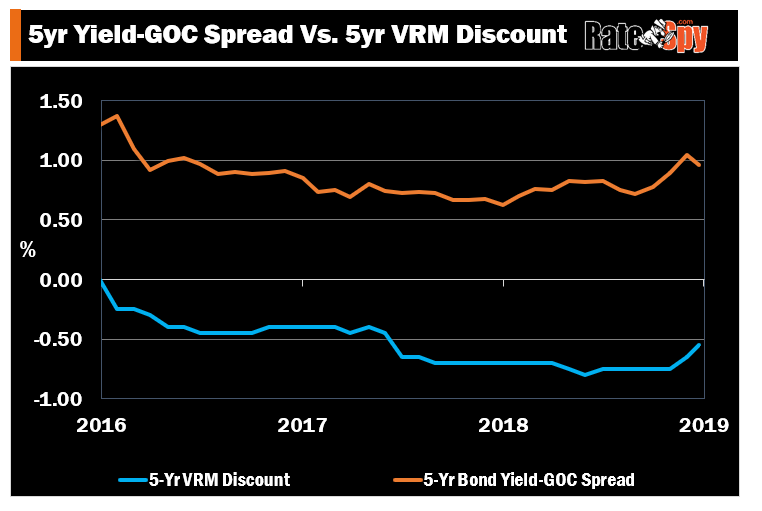 There just aren’t many indicators that can forewarn the average Joe about shrinking VRM discounts. That’s why the ones we’ve witnessed over the last two months have been a surprise to most. One indicator that’s reasonably predictive is the spread between big bank borrowing costs and the government of Canada’s borrowing costs. You can see an example of that spread in the chart below. It shows the Big 5 Banks’ average five-year funding costs in the bond market versus Ottawa’s 5-year funding costs. Big banks are the #1 funders of variable-rate mortgages in this country. When it starts costing them materially more to raise capital relative to the government, the banks pass that along to mortgage borrowers. In fact, this chart below shows (to the extent we have data on it) how these two elements tend to track each other. Most likely, variable-rate discounts won’t get terribly worse in the near-term. It would probably take more stress in the economy and financial markets for that to happen. But if things start to unravel again in Canadian and global markets, there’s a good chance we’ll see a resumption in the deterioration of discounts. * Effective rate including cash back. I was expecting the spread to shrink. Others and you were encouraging buyers to go with variable and many did and financial institutions must have noticed that and here you go the variable is brought close to fixed and now buyers have no choice but to go with fixed. The morale of the story is you as buyers or those advising them can’t play smart with big players because they have the tools to dictate what they want. It’s better to leave the freedom to the consumer to pick. This doesn’t mean you can’t recommend but it won’t work for long. Couldn’t disagree with you more, Michel. 1) People were recommending variables well before banks changed their pricing. They (we) did so because variables were the best play at that time for qualified borrowers, based on the rates and spreads at that time. That was on top of the other floating-rate benefits (their long-term statistical edge, their penalty advantage, their conversion option, etc.). Indeed, many folks did “play smart,” contrary to your advice, and won by going variable. 2) With rates as low as 2.65% to 2.95% (prime – 1%), variables are still the best play for a whole whack of people. 3) “Big players” were mainly reacting to funding costs, which were influenced heavily by market rates and risk/liquidity premiums, when shifting their variable-rate pricing. 4) To the extent big banks repriced variables to influence deal flow, this factor certainly didn’t make it less prudent to go variable when the rate differentials and one’s personal circumstances warranted. 5) Regarding “buyers have no choice but to go with fixed,” borrowers have all kinds of choices. One is a one-year fixed, which tracks variable-rate pricing over the long-run and can be a solid alternative for the right borrower. A lot of people take a one-year until healthy variable-rate discounts return, and they always return. 6) What we’ve found is that laypeople who don’t live and breath mortgages for a living seem to appreciate commentary that helps them make better decisions. You may want to consider adding consumer value in your comments. At the very least, if you’re going to take a dig at people’s advice, make a logical argument.